After climbing to the fourth spot last month, the UAE passport has gone up to become the third most powerful passport in the world. The visa-free score of the UAE travel document is 163 with which the UAE passport holders canter 113 countries visa-free. 50 countries will be welcoming them with a visa on arrival, however the Emiratis will still be needing visas to enter 35 countries on the globe. The Passport Index ranking revealed that the UAE passport shares its berth with passports from Belgium, Austria, Japan, Greece, Portugal, Switzerland, United Kingdom, Ireland and Canada. Singapore and Germany top the list with a visa-free score of 165, while US, South Korea, France , Denmark and Sweden are among the 11 countries sharing the second position and having a score of 164. 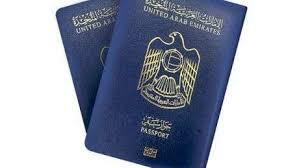 The UAE’s passport power got a boost as a result of positive diplomacy, focus and determination. Now more and more countries are paying importance on the power of their passports and how easily their citizens can travel across the globe stated Armand Arton, president of Arton Capital, the inventors of Passport Index. He further mentioned that the success of UAE’s initiative has become a testament to other nations and any vision can manifest with the power of positive diplomacy.